For DownBeat Magazine, ca. 1947. Call it chance, fate, destiny, or kismet. Often sheer luck--good or bad--determines the shape of our lives. Eighteenth century poet and philosopher Johann Friedrich Von Schiller believed that "what seems to us mere accident springs from the deepest source of destiny." He never met 20th century photographer William P. Gottlieb, but if he had, Schiller would have marked him as "Exhibit A" in the perpetual philosophical trial of free will vs. determinism. Portrait of William P. Gottlieb, ca. 1940. William Gottlieb planned to become an economist, but instead of spending his life devising dry theories on the workings of capitalism, he became a capital photographer. Gottlieb spent his life creating some of the best pictures ever snapped of great musicians. The Library of Congress (LC) recently digitized and posted over 200 of Gottlieb's portraits of jazz giants--with hundreds more to come--on one of its Flickr sites. But a biography of Gottlieb in the Library's Performing Arts Encyclopedia, reveals that these fabulous photos would never have been taken without a case of food poisoning, a rained-out tennis match, and a cash-strapped newspaper. William P. Gottlieb was born in Brooklyn, New York on January 28, 1917. Gottlieb was orphaned in his early teens, a sad fact that nevertheless may have encouraged him to take risks and follow his heart. After high school graduation, he pursued a degree in economics from Lehigh University. 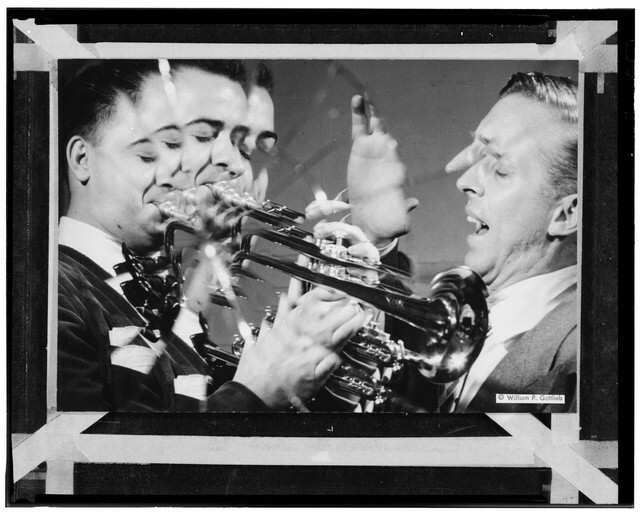 Gottlieb's membership in a fraternity led, in a somewhat convoluted manner, to his interest in jazz. The day before the end of his sophomore year, the cook at Gottlieb's frat house dished up a meal featuring underdone pork. For Gottlieb, and several of his "brothers," this resulted in a severe case of trichinosis and a summer's worth of bed rest. at the Paramount Theater, ca. 1946. Gottlieb's sickbed boredom was frequently eased by a high school friend, "Doc" Bartle. Bartle was a sometime classical pianist, but his music of choice offstage was jazz. 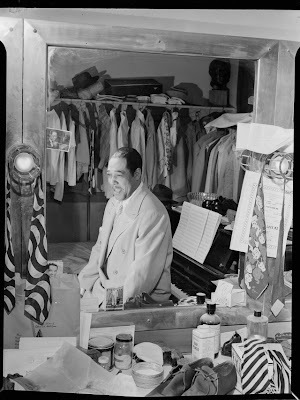 He often brought along the latest jazz records, by artists like Duke Ellington and Louie Armstrong, when he visited his convalescing pal. Gottlieb's casual listening to jazz soon became a habit, and a genuine jazz buff was born. Upon returning to Lehigh, Gottlieb became the editor of the school's monthly magazine, The Lehigh Review. 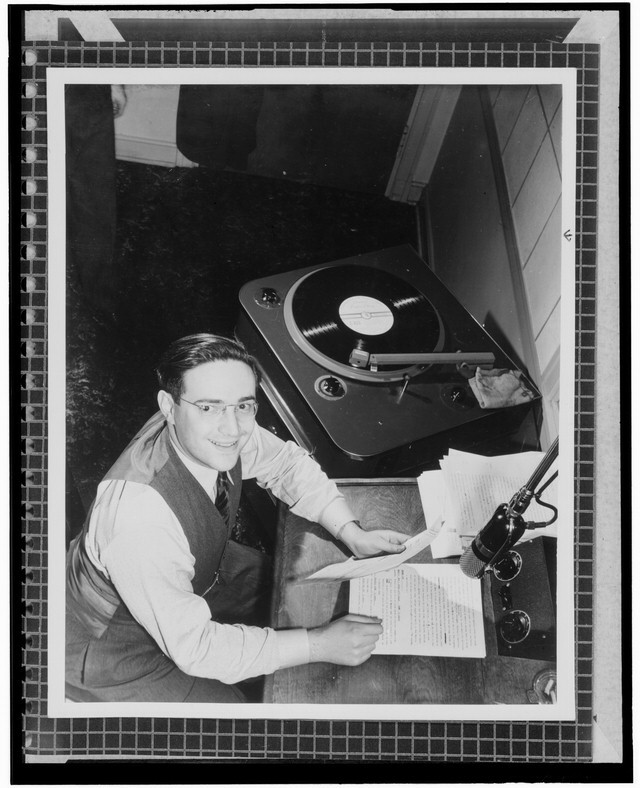 As editor, Gottlieb ran articles on live jazz performances in Philadelphia and New York City in every issue, along with monthly reviews of jazz records. He also began to have an interest in photojournalism, which was on the rise due to the popularity of Life and Look magazines. The multi-talented Gottlieb was also on Lehigh's varsity tennis team, which led to the second happy accident that changed his life. And once again a friendship was instrumental in maintaining William Gottlieb's connection with the world of jazz. Buddy Childers and Stan Kenton, ca. 1946-47. A college buddy of Gottlieb's was the nephew of the business manager of the Washington Post, Don Bernard. When the friend learned that Gottlieb would be playing in a tennis tournament in Washington, D.C., he encouraged his pal to call his uncle. Gottlieb listened politely but thought it unlikely he'd have time to chat with Bernard, since the tennis team would only be in town for a day. But he did bring some writing samples with him--just in case. When the tennis matches were rained-out, Gottlieb called Bernard's office at the paper. Bernard just happened to be in on that particular Saturday, and told Gottlieb to come on over. Despite the fact that the college kid was still in his tennis whites, Bernard was impressed enough with the writing samples to recommend Gottlieb for a job in the advertising department of the Post. Upon graduation from Lehigh in 1938, Gottlieb became an ad salesman for the paper. After a few months on the job, Gottlieb offered to write a weekly column on jazz for the Sunday edition. The Arts Editor agreed, and his pay jumped from twenty-five to thirty-five dollars a week. 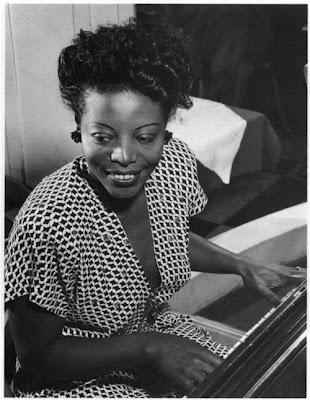 But more importantly, he became the writer of the first jazz column to appear in a daily newspaper. At first a Post photographer was assigned to illustrate Gottlieb's column. But soon the management of the paper decided the arrangement was too costly, and the lensman was reassigned. Unwilling to publish the column without photos, Gottlieb sold his prized record collection and used the proceeds to buy a camera. With a lot of help from the Post's staff photographers, and a tremendous amount of practice, William Gottlieb taught himself how to take photos that were not only good enough for publication, but were works of art in their own right. By age twenty-two, Gottlieb was known in the Washington, D.C. area as "Mr. Jazz." But Mr. Jazz had a growing family, so he left the advertising arm of the paper in 1941 to earn a graduate degree in economics at the University of Maryland. However, he never gave up writing and illustrating his Sunday jazz column. 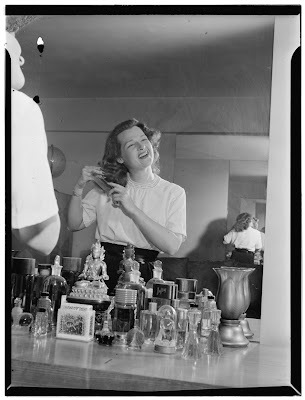 After serving as an Army photographer in World War II, Gottlieb once again followed his heart, and in 1945 he moved to New York City, determined to become a full-time jazz writer and photographer. He stopped in at the New York office of DownBeat magazine, and was pleasantly surprised to learn that the staff was not only familiar with his work for the Post, they downright admired it. Gottlieb was hired on the spot as an assistant editor. 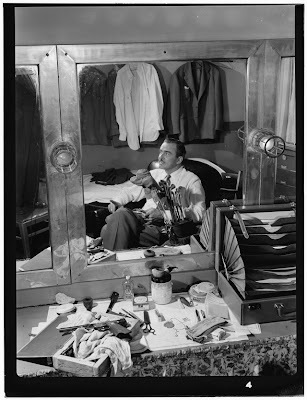 Soon, Gottlieb's photographs became even more popular with DownBeat's readers than his writing, and several of his shots even made the magazine's cover. For five years he documented the New York jazz scene, photographing and writing about many of popular music's greatest artists. But, by the end of the decade, the jazz scene was changing, and Gottlieb was worn out. Feeling out of touch with the newest music, and wanting to spend more time with his family, Gottlieb left DownBeat. As he put it, "I was really something of a square; I had a wife and children, and the joys of staying out until four a.m. with musicians, even those who were my idols, had evaporated, especially since I was often the only sober one there." Based On Gottlieb's Photos, Issued in 1994. But even after his "retirement" from the jazz scene, William Gottlieb's photos lived on. 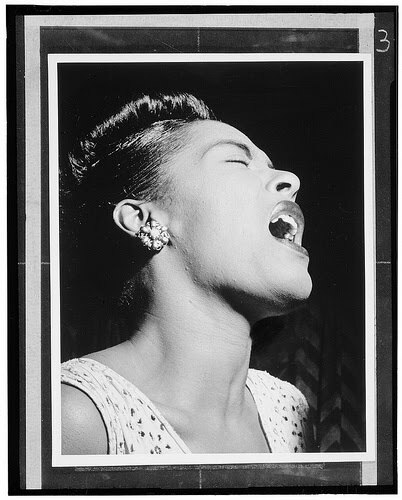 His photos from 1938 to 1948 are among the most frequently reproduced jazz images in the world, so iconic they were even used as the basis for a series of United States postage stamps in 1994. 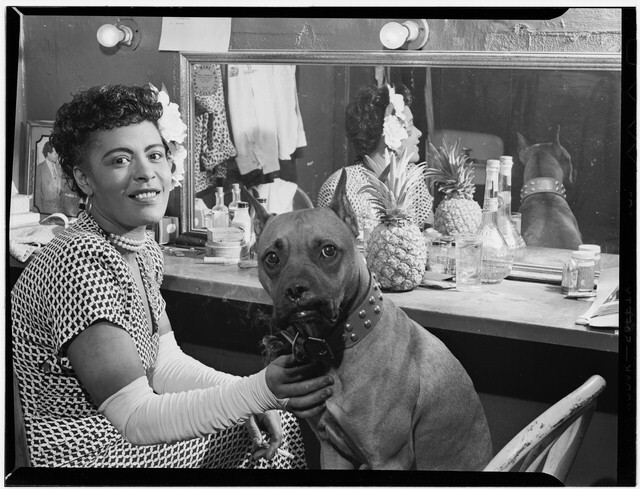 More than 200 of his photos were collected in a 1979 book, The Golden Age of Jazz. 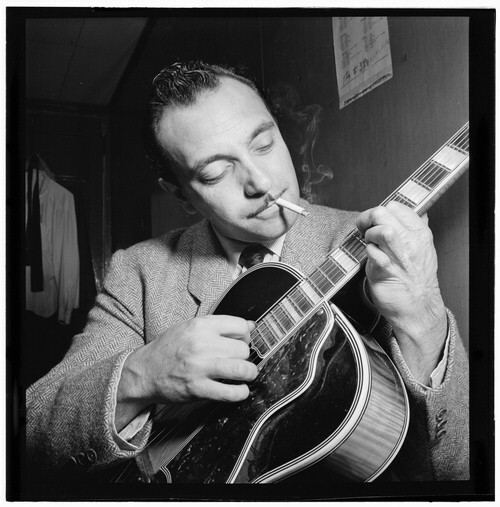 In 1997, Gottlieb became the first photographer ever honored with DownBeat's Lifetime Achievement Award. He remains a member of good standing in the Jazz Photographers Association, still takes on the occasional assignment. Not bad for a guy whose career in jazz journalism began with bellyful of roundworms. Thanks to the Resource Shelf for the lead. I knew there was a reason my tribe doesn't eat pork...Thanks for bringing Gottleib's career to light. After reading your posts, I always come away having learned something new. A wonderful story of accidents lining up just right.